The New Flagship Panasonic Lumix GH5 DSLR Professional 20 mega-pixel Camera is best for photos and 4K video performance in a durable magnesium alloy body. 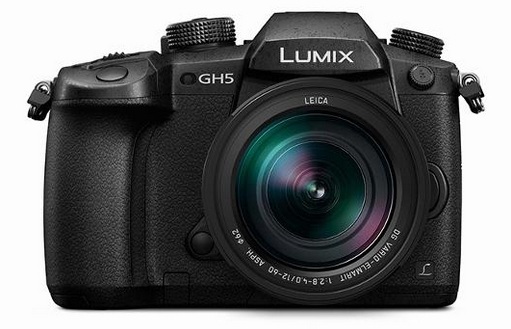 The GH5 is the latest in the line of Panasonic’s top GH series of mirrorless camera. The GH 5 looks a bit like the competing Olympus OM-D E-M1 Mark II. The camera is a 20.3MP Digital Live MOS sensor and a newly developed Venus Engine processor, which offer improved processing times over its predecessor. Video: 4K/UHD at 30fps 4:2:2 4K/UHD at 60fps 4:2:0 8-bit (internal), up to 4K/60p 4:2:2 10-bit (HDMI). It consists of USB-C 3.1 Gen 1, HDMI, mic, headphone, flash sync ports. You can record 4K up to 60 fps, as well as the ability to record 4K video without any cropping on the sensor. GH5 support two SD card slots, both of which are UHS-II compatible, for auto switching, creating an automatic backup, or selecting which files are saved to which card for an organization. GH 5 is Splash/Dust/Freezeproof/ Rugged Design. The LUMIX GH5 is capable of 4:2:2 10-bit real-time image output to an external monitor or recorder via an optional HDMI cable. DFD Ultra Fast Motion Detection & Focus allows the GH 5 to calculate focal lens movement by comparing depth of field values of two images at incredibly high speed. Its battery size is 1860mAh. AE bracket single/burst, 3, 5, 7 images in 1/3, 2/3 or 1 EV step, max. Flash Mode Auto*, Auto/Red-eye Reduction*, Forced On, Forced On/Red-eye Reduction, , Slow Sync./Red-eye Reduction, Forced Off * For iA, iA+ only. Slow Sync. Synchronization speed Less than 1/250 second.